No matter what country you decide to visit, you should do your best to familiarize yourself with the native laws and customs. It seems obvious enough, but many people (myself probably included) are guilty of slacking when it comes to this important travel safety tip. Granted, though - laziness aside, it can be a difficult thing to prepare for. What are you going to do, seek out a legal codex for said country and search for laws you might violate? No, but it's also not unreasonable to consider certain objects and substances. I'd be careful about anything weapon-related -- guns, knives, bats, battle axes; chemicals; drugs -- be they medicinal or otherwise; etc. Chances are an old Columbian gentleman ignorantly bringing his "medicinal" marijuana into the US is not going to get through customs. 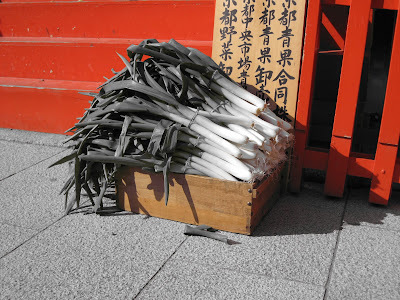 Likewise, be careful what you bring to Japan. This Japan Times submission recounts the story of an old man who surrendered his pocket knife to a police officer and was promptly tossed into the big house (or small house, since everything is miniaturized in Japan). This isn't the first time I've heard this kind of horror story. Honestly the guy probably just always carries around this pocket knife and it never even occurred to him that some countries don't allow them. They're useful tools, and kind of ingrained in American culture (yeah, we do love us some weapons). Looking at this story, the arresting cops do seem like major $%@*heads. If things went down the way this article presents, they saw a foreign tourist, decided to bait him, and got themselves a legal arrest. Yay for them. If he had lied, he probably would have gotten away with it. The lesson here, clearly, is never tell the truth. Ever. But seriously, think twice about what you're bringing with you when you go abroad. For example, some cold medicines are not allowed in Japan because when broken down into their components they can be used to make meth. They're serious about drugs and weapons here. 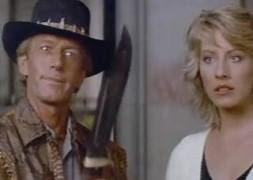 Besides, if you're gonna bring a knife, do it right. You may recall a certain post a couple of weeks ago about a certain invitation that was too early for my tastes. Well, it was an interesting day. My friends and I wound up making udon noodles. Well, we helped. Well, mostly Rachel helped while Joe and I alternated between watching supportively and sitting on the couch. We did stomp on some dough, though. Oh yeah, we stomped it good. 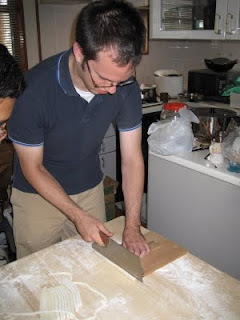 Here's a token shot of me doing a little dough cutting. Prior to this, we placed the dough in plastic bags and stepped on it. I guess it was comparable to kneading (although we did that, too, earlier). After the cutting, the dough was boiled in 出し (dashi), which is soup stock usually made from fish. It came out quite well, but took something like 3 or 4 hours to make. The meal was also...interesting. We started around 1 and just sat and ate noodles and sushi until about 4 or 5. There were some awkward conversational points, which I will attempt to briefly and diplomatically recount. First off, let me paint a broad brushstroke by saying that while Japanese people are generally very polite and the Japanese language is built around ambiguity and diplomacy, the Japanese can be very unabashedly blunt and forward, to the point that confrontation can easily arise if the situation is not carefully handled. At one point, one of the other guests asked my friends and I (in Japanese), "Which would you rather work for - a Japanese company or an American company?" I looked at my friends and inwardly groaned. I could have said "both are good" or something vague and diplomatic, but I was already pissed from an early dialogue. "An American company," I replied. The man's smile wavered a little. "Japanese salarymen (office workers)," I started. "I'm a salaryman," he interupted, subtly warning me. "Yes, well, Japanese salarymen work too much," I finished. 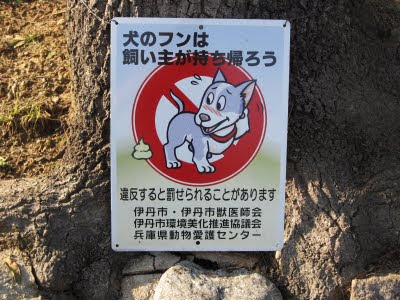 "Japanese companies are very strict. In America, we don't work as much overtime. In fact, some companies limit overtime." He asked about our working hours in America, and tactfully explained that his impression of an American businessman is someone who works 12 hours and eats hamburgers for breakfast, lunch, and dinner. Growing weary of the conversation, I conceeded that maybe there were some people like that, and that certainly the top businessmen at many companies would work many hours and maybe eat a lot of fast food. Eventually we drifted into another topic. The earlier conversation that really got me annoyed was (of course) political. Let me lay my cards on the table - I am a conservative. I like to consider myself fairly open-minded and open to discourse, though. One of my best friends from college is perhaps one of the most liberal people I know. The trick is to be respectful and not let it get personal. When Obama came up in conversation, I knew where things were headed. I did my best to smile and nod and say nothing, but apparently they detected a glint of skeptisim in my eye. Or maybe it was the uncomfortable glance I shot at Joe. "You don't like Obama?" asked my VP and his wife. "Why not?" I did my best to explain in Japanese, but lost my composure and resorted to English, which they could basically understand. "Well, I don't really like politicians in general," I started, trying to keep things light and simple. "Basically I think Obama made a lot of promises that he can't keep." I was being charitable and simplifying my views to the max. "I take it you like him?" I asked with a smile. "Well, he's a lot better than Bush," remarked the VP. Catching my look (and entirely missing the look his wife was giving him to indicate that a change the topic might be prudent), he returned the question. "You like Bush?" I then muttered something about not loving him, but liking him better than Obama. Anyhow, my friend and I vented our frustrations afterwards over a pizza. At least the pizza was good, and predictably the waitress was cute. I peeked inside, and this joint is basically just a cafe with a small adjacent playroom rigged with some tubes and a ballpit, 'a la McDonalds. 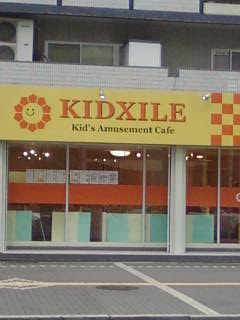 Kidxile: For when your kids are driving you *$@#ing nuts. I think most of us already know that Japanese manga are weird, but here's something further. My favorite part is the two exclamation points. I just got back from playing pool in the city with an American friend and two Japanese teachers. Almost a year ago we tried to ask them if Japanese people trash talk in competitions or sports (we wanted to learn some choice phrases) and they seemed unsure what we meant. After tonight I can tell you, Japanese people do trash talk in their native language, too. It's good to see that Japan has been taking a hard line with North Korea, just like the U.S. and the U.N. The Japanese government recently lodged a formal complaint with the North Korean government for firing yet another missile into the Sea of Japan. Take that, Kim Jung Il - Japan is displeased with you! I suppose I ought to be fair to Japan - at least there's not really much they can do. Their SDF (Self Defense Force) doesn't compare to the U.S. military. I mean, I guess they could launch natto back at North Korea, but that would probably just make things worse, wouldn't it? Of course by "only in Japan" I mostly mean "not in America." Maybe many other countries exhibit similar behavior, but I don't have the luxury of such knowledge to draw comparison. Anyway, it's Sunday and I woke up at 7:00 a.m., and not for Mass. The vice-principal of my base school invited me and a couple of other ALTs from his previous school (who I am, coincidentally, friends with) to his house today. I'm not quite sure what we will be doing, but there are rumors of noodle making. 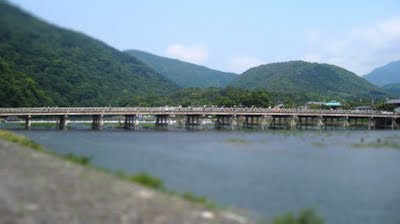 We are to meet at the station near his house at 9:00 a.m. I can't come up with any other explanation other than that Japanese people detest sleep. So many perfectly good hours in a day; it's not that I don't appreciate being invited to his home, but wouldn't a more middlish time of day have been more pleasant? Apparently not. Japan is a land of dichotomies. Kyoto, the city of ancient temples and peaceful greenery, stands in stark contrast to the neighboring Osaka, just to the south. This photo was taken just inside the entrance of the Fushimi Inari shrine - in my opinion, one of Japan's most impressive. Most of the times I've spotted ninja(s?) in Japan, they've been too agile to photograph. 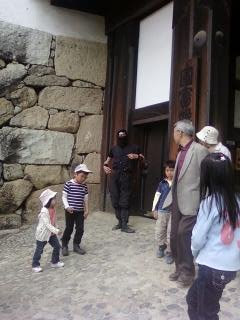 I caught this one, though - a ninja hanging out at Himeji castle. Not his lucky day. Careful, though, kids - he's still a ninja, and they're dangerous. Look - I think he's about to do something lethal. Ah, fermentation - the process by which we have so many wonderful alcoholic beverages. For many of us, I think I am safe in assuming, the alcohol in these potent potables is often the ingredient that makes them more appealing than, say, a soft drink. I mean, sure, taste matters - don't get me wrong. Sometimes on a hot day or after eating something really salty, like an entire pallet of squid jerky or a bag of potato chips, a nice, cold beer just hits the spot - am I right? Before I make my point, and there is one coming, first allow me to concede that I'm not exactly the exemplar of the beer drinker. Sure, I enjoy imbibing a few from time to time, but for me, especially here in Japan, it is more about having something alcoholic that can go down quickly and smoothly. Back home my friends made sure I was nursed at the humble bosoms of the likes of PBR, Coors, and Natty Light. Micro brews and high quality labels have never been my thing, for I am the anti-beer snob (Ben - my wallet salutes you). So it is with this background and in this spirit that I question the sanity of those who buy products such as this. No-alcohol beer? Why even bother? I suppose you may tell me it's about taste, but then I may tell you that you're full of it. In case you don't care to read the article, Japan's Kirin Brewery just recently busted out what it claims to be the world's first really 100% non-alcoholic beer. And according to the article, it's selling fairly well, especially among truck drivers, pregnant women, hospital patients, and "beer lovers on long-distance golfing trips" (wtf?). Yeah, that's an important demographic right there - good capture. But what did I expect from the country that sells little baby cans of beer? Seriously, I think they're like 75 ml - that's roughly 2.5 oz. 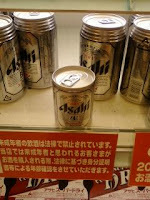 I guess they're pretty serious about their beer being accessible to everyone - even those women who get drunk after like two sips (over half the Japanese female population).